Two cantatas written by Johann Sebastian Bach for Michaelmas in 1726 and 1728/29 respectively build the framework of this recording. They tell of the Archangel Michael‘s victory over Satan. At the center of the cantata „Es erhub sich ein Streit“ is the tenor aria „Bleibt, ihr Engel“ (Stay, ye angels), which gives this recording its name. Embedded in these two magnificent, dramatic works with timpani and trumpets are two more intimate cantatas that sing the song of peace. 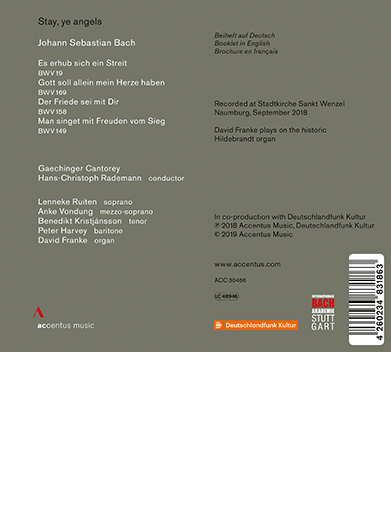 In the introductory Sinfonia and the two alto arias of „Gott soll allein mein Herze haben“, the organ is highlighted as a virtuoso solo instrument – perfect for the Hildebrandt organ of St. Wenzel in Naumburg, which lends a special color to this recording. The final chorale contains a message that can also be found in the subsequent solo cantata „Friede sei mit Dir“ and can be regarded as a statement of the entire program: „So that we love one another from our hearts and remain with one mind in peace“.